To wrap up my series of articles on the impacts of players on their teammates’ three-point shooting, I thought I’d take a look at perhaps the most important aspect: can we use the available data to evaluate players and predict the future? Predicting the interactions of players is nearly impossible, but how close can we get to modeling certain aspects of these interactions? The correlations can be interpreted as follows: if Player A scores one more point per 40 minutes than Player B, then Player A increases his teammates’ three-point attempt percentage (how often they shoot threes) by 0.16% more than Player B. Because increases in three-point attempts and three-point percentage generally are good things, it makes sense that most of the correlations in the table are positive. Players that perform better in these advanced statistics have a more positive impact on their teammates, with the exception of Rebounding Rate. For the statistically inclined, all of these are significant at the .01 level, with the exception of Rebounding Rate. With the exception of Minutes Per Game (which may just be a reflection of overall ability), the R-squared values are all very low. In a hypothetical and easier world, they’d all be higher. Unfortunately this is the real world, and basketball is much too complicated for us to be able to predict complex player interactions based on a simple stat or two. Before I go any further, let’s recap what we know so far. There is a significant correlation between most advanced statistics and interaction effects on three-point shooting, so we know that these things aren’t random. But these stats explain only a very tiny part of the story, so we know that interactions are very complex. The next step I took was to attempt to develop a model that would predict a player’s impacts on three-point shooting using a combination of the different statistics. 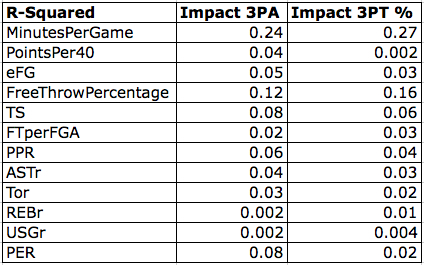 After playing with the numbers, I was able to achieve an R-squared value of 0.26 for Impact 3PA and 0.36 for Impact 3PCT. These numbers were boosted to 0.45 and 0.51, respectively, if we took the other impact number into account (using Impact 3PCT in the Impact 3PA regression and vice versa). But this defeats the purpose of the study, so we’ll ignore those most recent numbers. What does this next step tell us? Within the limits of linear regression, we can only explain about 26% or 36% of a player’s impact on his teammates’ three-point shooting using various available advanced stats. In the real world, those numbers aren’t horrific, but they’re far from being the keys we need to truly figure out the game of basketball. Finally, let’s switch gears and examine how consistent these interaction effects are from one year to the next. After all, if they are totally random, there should be no correlation. 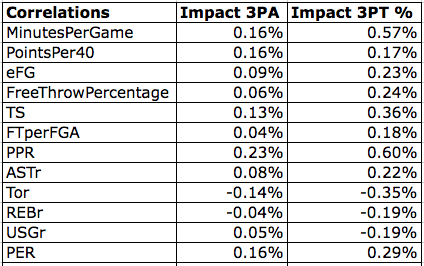 Using the numbers from 07-08 and 08-09, I ran regressions for Impact 3PA and Impact 3PCT. Both regressions resulted in statistically significant, positive correlations. That’s good. But the R-squared values for the regressions were .05 and .1, respectively, which is not so good. In other words, knowing how a player affected his teammates’ three-point shooting last year will only tell you a little bit about how he’s going to do this year. Another interesting thing to look at is the impacts for players that switched teams. If players have similar impacts no matter what team they’re on, we may be on to something. When we limit the sample to these players, we again get statistically significant but not particularly informative results. Both regressions are significant at the .02 level but produce R-squared values under .1. No matter which way you slice it, you get the same idea: good players make the players around them shoot threes more often and more efficiently, but that’s all we can say for sure. We can quantify what’s already happened, but we can’t predict the future. If you’re still reading now, you’re undoubtedly more interested in this stuff than the average fan, and you may have some suggestions for me. If so, send me an e-mail at jonnichols@basketball-statistics.com. Good Afternoon I read your comment , I really enjoyed it I will return soon. Good!.